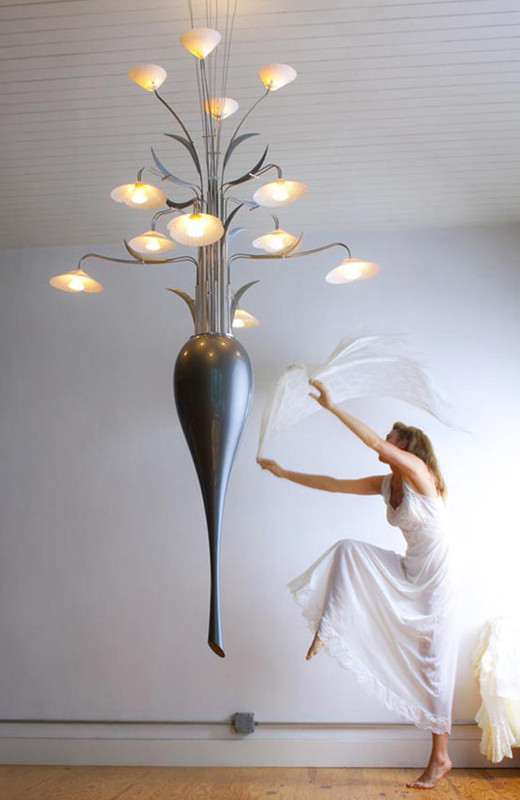 This is a much larger, three tiered version of the original Hydra Chandelier. It is 6 feet high top to bottom not including its suspension. It has a lacquered hand-turned teardrop counter weight and hand-carved crescent details. The center hub is machined in aluminum and the arms are fabricated in stainless steel. The shades are made from polycarbonate. It uses twelve MR-16 halogen bulbs. Diameter is 37" from shade to shade. Height is 72" from teardrop tip to the top shades. Suspended height is made to order.